"It is unlawful to feed wildlife," says the sign that greets visitors to the Pacific Rim National Park on Vancouver Island's west coast. It's a rule that's competing against a long history of human behaviour. Many people are bent on 'helping' animals, earning their gratitude and luring them closer, within range of eye or camera lens. Whether our actions are motivated by goodness, curiosity or ignorance, the result is the same. When they become habituated to humans, animals lose their fear of us in their search for the food we give them. Labelled as 'garbage' animals, they're often destroyed. Such was the case with two young wolves on Vargas Island in Clayoquot Sound, an island rimmed with long sandy beaches and fringes of old-growth, temperate rainforest. Thousands of visitors come here annually, by sea kayak or motorboat. It's unclear when these two wolves, one male and one female, began to receive food from humans. Some say locals started it; others blame campers. Regardless, the situation soon got out of hand. In May of this year, two Vargas Island kayak guides encountered a young male wolf. They described an animal unafraid of humans, that wasn't scared off by group attempts to get rid of it and that ran towards any rocks thrown at it, sniffing to see if they were food. While the boats were packed up, one person had to wield a paddle to keep the wolf away from food bags. Convinced that this behaviour would cause havoc among unsuspecting tourists, the guides recommended that the wolves be shot in a pre-emptive strike. Warning notices were posted at kayak launch sites, which, strangely, may have actually attracted people to Vargas. One local even saw photographs of campers hand-feeding the wolves with hot-dogs. On 2 July, a young kayaker who'd fallen asleep near his campfire, woke to find a wolf tugging at his sleeping bag. He sat up in panic. An altercation ensued. Wakening to horrific screams, his friends managed to scare off the wolf. The kayaker had lost a good portion of his scalp in the attack and was lucky to survive. The incident made flash-point news. The Big Bad Wolf of legend had returned. The fact that there is only one other recorded attack by a wolf on a human in British Columbia paled beside the evidence. A wild animal had almost killed a defenceless human being. For those of us working to halt the persecution of wolves, this came as a heavy blow. Unlike the kayaker, the wolves did not survive. The conservation office shot them the next day. They were two years old and in good health. They were just like their wild relatives, with one exception: the 'wild' had been fed out of them. The 300 gray wolves that roam the wilds of Yellowstone National Park and central Idaho won't be leaving anytime soon, thanks to a decision by Denver's 10th Circuit Court of Appeals. In January, the appeals court overturned a 1997 ruling that called for the removal of the wolves that had been introduced to Yellowstone and Idaho by the U.S. Fish and Wildlife Service (FWS) in 1995 and 1996. Wyoming judge William Downes had issued the 1997 eviction notice in response to a lawsuit brought by the American Farm Bureau Federation (AFBF), which insisted that the wolf reintroduction was illegal because it violated the Endangered Species Act (ESA). Because ranchers were worried about wolves attacking livestock, the wolves had been introduced as an "experimental, non-essential population"--a condition that made it legal to kill or relocate problem wolves. However, under the ESA, the wolves could only be granted experimental status if that status did not endanger naturally occurring wolves already in the area. Since solitary "natural" wolves had occasionally been reported in the areas of reintroduction, the AFBF claimed the reintroduction program violated the ESA. But the 10th Circuit Court of Appeals in Denver disagreed with the AFBF and decided that Downes' 1997 ruling ignored the larger intention of the Act. A "restrictive interpretation [of the law] could actually undermine the department's ability to ad dress biological reality, and thus handicap its ability to effectuate species recovery," the court said during its ruling. Environmentalists hailed the case as a precedent-setting win that not only keeps wolves in Yellowstone, but also gives the ESA increased flexibility. "It is gratifying that the appeals court would not allow overly technical interpretations of the Endangered Species Act to stand in the way of its true intent," says Mark Van Putten, president of the National Wildlife Federation (NWF), the first group to appeal the wolf eviction order. According to Defenders of Wildlife President Roger Schlickeisen, the appeals court decision protects a special provision of the ESA that allows for flexibility when species introductions are controversial. "If the appeals court had upheld the original decision, the law would have become so restrictive that many future introductions would be impossible" says Schlickeisen. The AFBF, however, feels that the ruling allows too much flexibility. "We're disappointed with the case," says Rick Krause, assistant counsel for AFBF. "It sets a dangerous precedent for everybody, because it tells the government that as long as federal officials comply with the general purpose of a law, it doesn't matter what the specific language is." Her human-given name was B45-F, and since she crossed the Snake River a year ago on a nomadic journey from Idaho to Oregon, the lone gray wolf has opened a raft of questions about the reintroduction of wildlife predators. At first, B45-F was a tooth-and-fur reminder of how successful wolf introduction has been across the United States. Today, she's representative of a battle being fought nationwide over how far wolves should be allowed to roam. Appropriately, the most decisive step yet on this issue will be taken Jan. 26 in Minnesota -- the state where wolves have made the most dramatic recovery. The state is expected to draw an invisible biological line in the sand, demarcating where the sometimes-popular, sometimes-reviled predators can be shot when they are removed from the federal list of threatened species here. It is a policy decision that has attracted no small amount of attention, with one prominent scientist controversially suggesting farmers should be given great leeway to shoot wolves. Moreover, the management plan for caretaking wolves will shape the direction of wolf recovery from the upper Midwest to the desert Southwest and the Maine woods. The recovery of wolves in the Land of 10,000 Lakes represents perhaps the finest example of government conservation agencies pulling a large carnivore back from the brink of extinction. In 1974, a year after the Endangered Species Act was passed, Minnesota was forced to protect the last pocket of wild wolves left in the Lower 48 states, a scattered population of only a few hundred. Now, researchers place the number at more than 2,400 -- almost double what scientists said would be necessary to delist the state population. 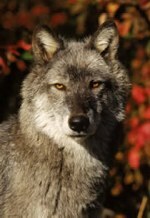 Much of the success is owed to a prohibition on wolf hunting, trapping, and poisoning that decimated wolves elsewhere. The recovery of wolves in Minnesota mirrors a trend of success in bringing wolves back to several regions. "We would be talking about maybe 10,000 wolves being back in the landscape [in the Lower 48]," says Robert Ferris, vice president for species conservation at Defenders of Wildlife, adding, "there were 200,000 wolves before we started monkeying around with the natural systems." The debate over how to manage the newly resurgent population of Minnesota wolves, however, has been stirred by L. David Mech, a biologist with the US Geological Survey's Biological Resources Division, who is renowned as one of the world's premier wolf gurus. Ironically, Mr. Mech -- a fierce wolf advocate -- argues that Minnesota must allow leniency for wolf killing in the state's farm country, lest citizens grow less tolerant of wolves. What Mech is concerned about is a public backlash against wolves if society isn't prepared for headline-making encounters that are bound to occur. He claims that half of the wolves in Minnesota could be killed each year without it causing serious problems to the health of the population. "The biggest lesson emerging from Minnesota for other areas in the West is that zoning has to be part of the equation," Mech says. "There must be areas where wolves will not be allowed to live." Although livestock losses in the West have so far been less than expected, Mech predicts that they will increase threefold in Minnesota if wolf populations are not controlled. In addition, critics of wolf recovery programs say the animals are already causing problems in towns. For instance, wolves allegedly snatched a cat off a front porch in Glenwood, N.M., they say, prompting parents to keep their kids indoors. "You can't force these wolves down the throats of people who see them as a threat," says J. Zane Walley with the New Mexico-based Paragon Foundation, a property-rights group. In Minnesota, the fight between farmers and conservationists continues to mold the direction of the wolf-management program. The Minnesota State Cattlemen's Association has threatened to sue if it deems the state's latest plan too restrictive. Conversely, if the state opens the door to liberal hunting, trapping, and killing, the Sierra Club may take legal action to stall delisting. For the most part, though, the move to save wolves nationwide has been seen as a success. "Wolf reintroduction is a powerful demonstration of this nation's commitment to protecting and restoring endangered species," says Interior Secretary Bruce Babbitt. The federal government's wolf reintroduction efforts in the West were given a resounding affirmation two weeks ago when the 10th Circuit Court rejected a legal attempt brought by the American Farm Bureau Federation to have Yellowstone's wolves rounded up and removed from the park. With at least 116 wolves in Yellowstone, 145 in central Idaho, and 64 in northwest Montana, momentum is building to downgrade their status. According to officials inside US Fish and Wildlife Service, the agency may delist gray wolf populations in all the lower 48 states -- not just Minnesota -- soon after the Minnesota plan is released. Wildlife experts say it is highly probable that wolves in the northern Rockies could eventually disperse into northern California, Utah, Nevada, Oregon, and Washington -- just as B45-F did before she was trapped and returned to Idaho. For now, US Fish and Wildlife Service says any wolves that disperse from their original recovery zones will be given latitude as long as they don't prey on livestock, eat pets, or stake out territories on the edge of towns.